Techniques for protecting operatives against hazards encountered in many factories. Exposure to dusty air can put health at risk by irritating the eyes and the respiratory system or by aggravating existing respiratory problems. Furthermore, certain dusts are known to cause specific chest diseases. For example, rubber process dust has long been noted as a carcinogen and it has maximum exposure limits in many countries. Leather dust is another recorded carcinogen. Furthermore, there is the added risk of fire or explosion where dust is allowed to build up – either in the air or in extraction ducting. Dust can contain particles ranging widely in size, and it is the size and chemical nature of particles that determine the nature and severity of any ill effects on the body. Larger-sized particles (typically 100 micron diameter or less), which enter the nose and mouth during normal breathing, are called ‘inhalable dust’. Smaller in size is ‘thoracic dust’ (sometimes called PM10) which is 10 microns or less and can reach the lungs. If the dust is sufficiently small, it is called ‘respirable dust’ (5 microns or less) and is the most hazardous as it can be inhaled deeply into the lungs. The specific legislation which governs dust levels will vary from country to country. In the UK, for example, dust limits are set under COSHH regulations by the Health and Safety Executive and limits in the USA are set by the Occupational Safety and Health Agency (OSHA) under Standard 29 CFR. Many dust problems can be identified by a visual inspection of the work areas. Dust clouds, for example, may be visible or there could be deposits on floors, ledges and tops of machines. However, it is unwise to rely on a visual inspection alone when assessing a possible dust hazard, since respirable dust is too fine to be detected by the naked eye and small particles may be airborne for a long time after larger particles have settled. The only sure way of establishing if a dust hazard is present and its potential harmful effects is by atmospheric monitoring. 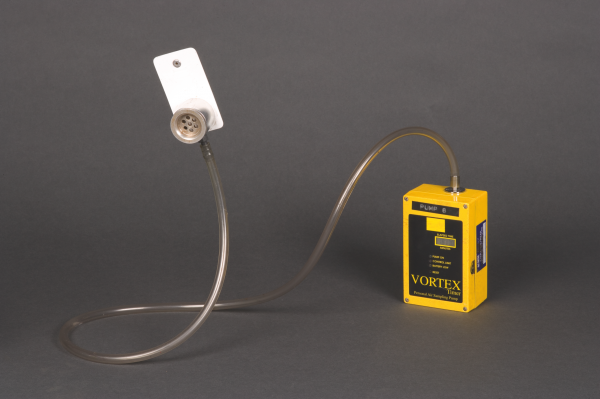 The standard method used by SATRA for monitoring exposure to total inhalable dust involves a glassfibre filter secured in a holder close to the operative’s face and connected to a small pump held on the belt or in a pocket, which pulls air through a pre-weighed filter (figure 1). The flow rate of the pump is calibrated before use, allowing the volume of air sampled to be calculated over the period of the test. The exposed filter is then reweighed and the exposure level calculated in mg/m3 from the weight gain over the test period. Figure 1: Equipment used by SATRA to monitor exposure to total inhalable dust. This method also forms the first stage of the technique that SATRA uses in monitoring exposure to rubber fumes generated during the vulcanisation process. The fine particles that make up the rubber fumes are collected in the filter, together with any other inhalable dust present in the atmosphere. After the exposure period, the rubber particles are separated from the non-rubber material by extracting (under controlled laboratory conditions) the weighed filter with cyclohexane. The change in weight of the filter resulting from the cyclohexane extraction is taken to be the mass of the rubber particles (and hence rubber fumes), to which the operative has been exposed during the monitoring period. 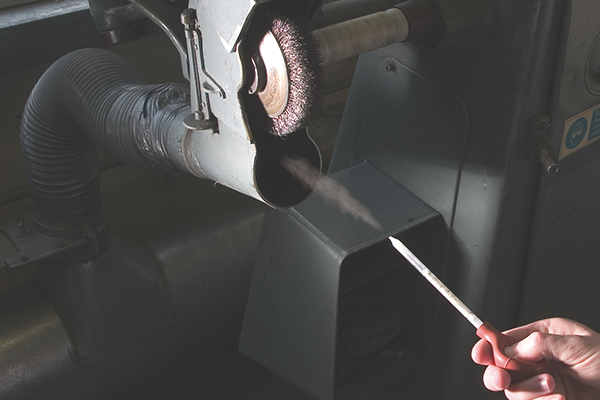 Dust monitoring should become part of a recognised health and safety management system. This will allow the factory manager to plan, measure and review health and safety issues in the workplace. Dust masks made from paper have historically been used to prevent inhalation of dust. However, these have been proved to be unreliable because they do not filter out the smaller dust particles, and there is the tendency for air to be inhaled around the sides of the mask. SATRA would recommend the use of disposable respirators that have been suitably tested and approved (for example in Europe, CE marked products). use appropriate respirators if the dust cannot be eliminated or reduced. Email healthandsafety@satra.com for more information on dust measurement and protection.